Big news! Goldfish Swim School is opening in Morris County this fall! Goldfish Swim School is the country’s leading water safety and swim lesson school offering infant and child swim lessons. Goldfish Swim School Denville joins six other New Jersey Goldfish locations. What Makes Goldfish Swim School Different? 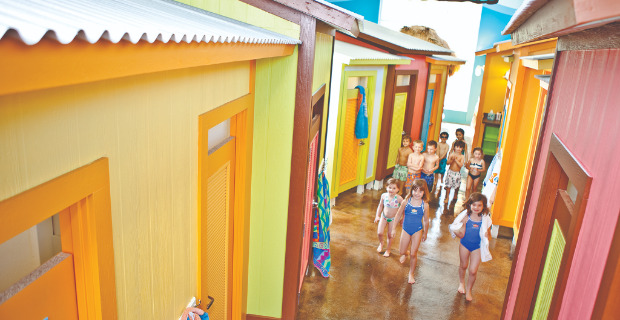 Goldfish Swim School provides swim instruction to children ages 4 months to 12 years-old in a unique setting. There is nothing else like this for families in the area! Convenience -- families with kids of different ages and skill levels can conveniently have all of their swimmers in the pool during the same half hour time slot. Family Swims, Birthday Parties and More! In addition to swim lessons, Goldfish Swim School Denville offers weekly family swims (for both members and non-members). Family swims are an opportunity for families to work on the skills kids learned in lessons and just have fun together in the pool! Goldfish also offers birthday party packages. Parties include exclusive use of the facility for two hours and the Goldfish team handles of the details including setup and clean up. Goldfish Swim School Denville anticipates a late 2018 opening. Families can pre-register for lessons now by visiting the website or calling 973/957-7400. Ask about the benefits of a limited-time only Charter Membership! Stay tuned for information on the FREE Grand Opening celebration! Connect with Goldfish Swim School Denville on Facebook for the latest updates.